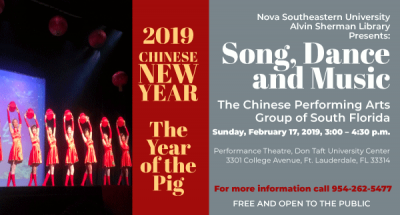 The NSU Alvin Sherman Library presents, song, dance and music highlight this performance by the Chinese Performing Arts Group of South Florida, CASEC. 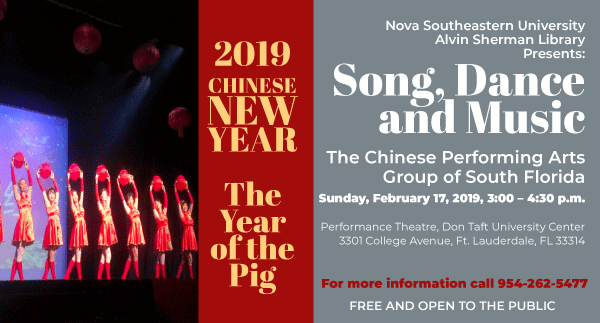 Sunday, February 17— 3:00 pm to 4:30 pm at the Don Taft Performing Arts Center. The Chinese Performing Arts Group of South Florida, CASEC strives to promote, preserve and share Chinese culture via the performing arts. It was founded in 2009 and has 20 plus members. They perform up to 24 shows per year. No registration required. Seating is on a first come, first served basis. For more information, contact 954-262-5477.